It’s December, which means many of us will have started to decorate our homes for the Christmas period. But there is one place that often gets neglected – covered in cards and left alone, your fireplace mantle. Here we have some tips for how to festively style your mantle for the cosy Christmas season. Sticking to a basic colour scheme each year will help your decorations not become too overwhelming in your space. But don’t feel like you have to stick to the obvious combinations. Bring in metallic tones like bronze and gold to offset bright reds and greens. If you are after a more quirky Christmas look, then go for block bold colours, daring to be different with blue and yellows instead of traditional red and golds. 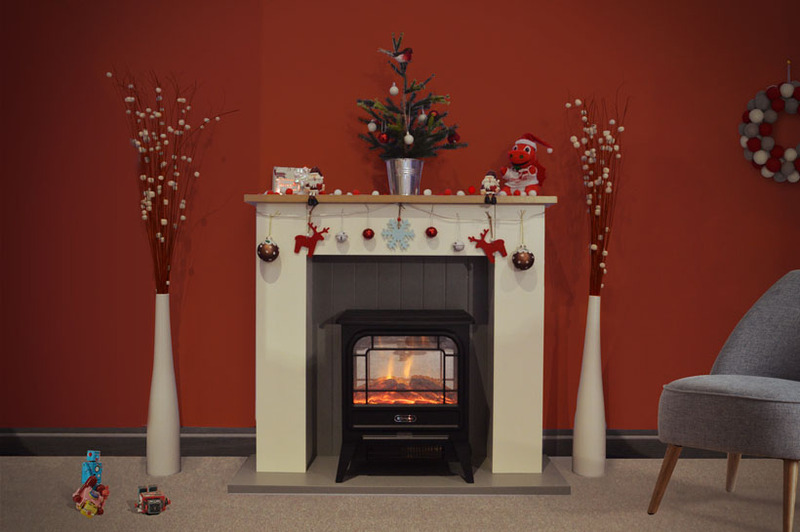 Due to Dimplex’s incredibly safe electric flame technology, you can experiment with different decorative styles as you wish – including bunting hung below the mantle shelf. Just ensure you are not covering or blocking the convector heater element if you do decide you need warmth as well as a flame effect from your fire. If you are after a jolly, there are many affordable ways of doing so. Get your children or grandchildren involved in making felt decorations, using simple pre-cut shapes and allowing them to decorate them however they like. You can also DIY your own Christmas pudding baubles by taking an old, plain brown bauble and painting on some PVA glue before dipping in glitter and leaving to dry. You can use this as your mantle bunting, and it can make for a great annual Christmas tradition with the little ones. 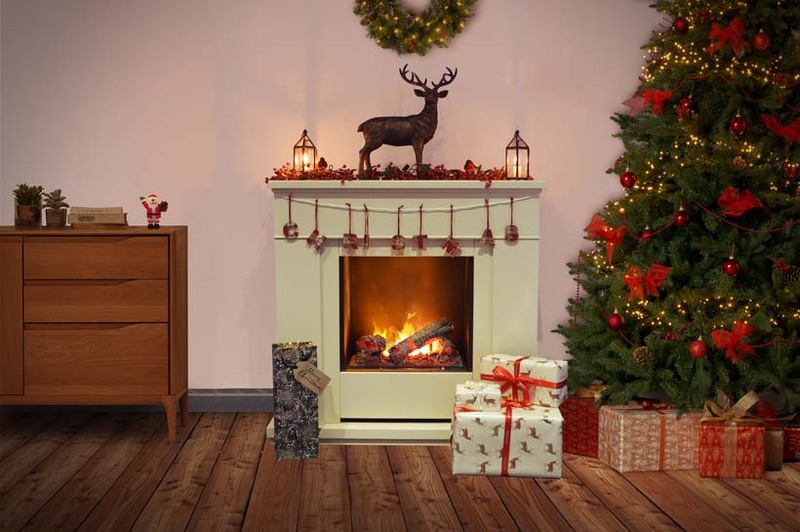 Be inspired by our stylishly simple ‘rustic woodland’ themed mantle. The simple lines of the Moorefield allow for striking decoration, so don’t shy away from a statement piece like our featured stag from Sainsbury’s. Update your Christmas garland with faux red robins to add to the woodland effect, and lanterns are great to enhance the cosy vibe in your living space. You can also ignite the senses by using a Dimplex aroma diffuser. Try out some seasonal essential oil recipes by mixing sweet and spicy scents to enhance the winter vibe of your home. For some themed essential oil combinations, check out our Twitter and Facebook feeds. Your fireplace enhances the cosy, warm atmosphere of your home, so take advantage of the opportunity to make it a true focal point in your room. Let us know how you will be styling your Christmas mantle by getting in touch on our Twitter and Instagram pages.